Our graduates work on Broadway, in LA and Chicago as actors, teachers, stage managers, and costume designers; for Augustana College, Davenport Junior Theatre, Goodman Theatre, and St. Croix Festival Theatre. 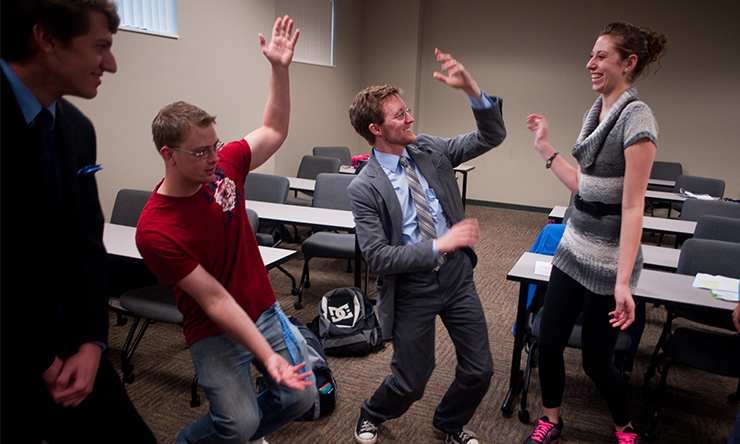 You get more than an education at St. Ambrose: you get real theatre experience. Learn from award-winning faculty and peers on the stage and behind the scenes, and embrace opportunities you won’t get at larger universities. We have an award-winning program, faculty committed to your success, and opportunities galore. You will grow in your acting skills and self-confidence, learn to develop characters, the art of stagecraft, and directing techniques. Courses include script analysis, costume design, stage lighting, scenic design, music theatre, and theatre history. And as an SAU Theatre major you will read an impressive variety of plays as part of your coursework. Take a look at the suggested reading list (pdf). Throughout the year, you can immerse yourself in a variety of productions which apply what you learned in the classroom. These range from musical theatre and directing (for upper-level students) to various showcases and intimate black box theatre shows (for all students). You also have the opportunity to study abroad with our "Theatre in London" course. It culminates in a two-week trip to London where students see up to 14 plays, visit Shakespeare's hometown, and study with British theatre professionals. Other locations include Greece and Ireland, but the world really is your oyster! St. Ambrose has robust Study Abroad opportunities. The Theatre Department is in Galvin Fine Arts Center with a modern, 600-seat proscenium stage that can expand to seat up to 1,200. The stage also hosts the annual Performing Arts Series, which allows you to attend professional touring shows right here on campus (and students get in free!). We also have the Studio Theatre, a black box theatre which hosts most of our student-directed plays. Our students love this intimate space because of its flexibility, giving you a variety of directing, acting, and design opportunities. We have great connections, and encourage all students to complete an internship in whatever area of theatre they wish to focus. 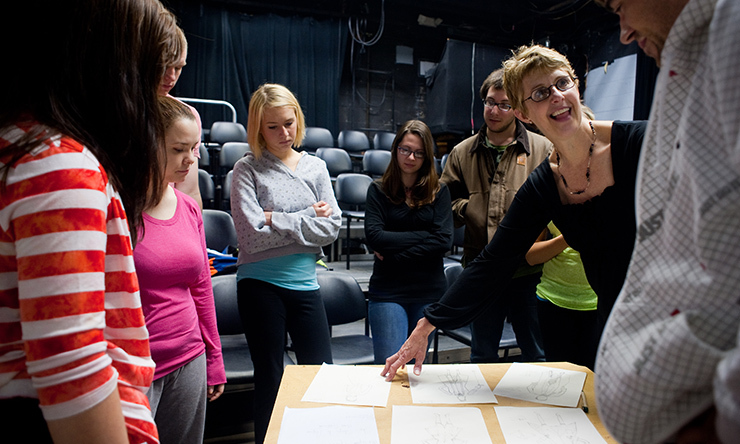 Our theatre majors have learned from professionals and peers on-site at The Goodman, The Guthrie, Festival Theatre, Circa '21 Dinner Playhouse, QC Workshop, Davenport Junior Theatre, Children's Theatre Company, and The Curtainbox Theatre. The SAU Career Center will help you find the internship right for you. 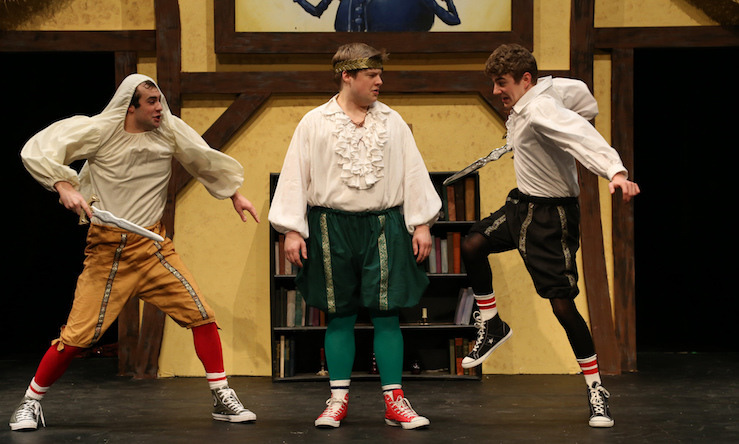 To make your education even more affordable, our Theatre Department offers numerous scholarships for current, transfer, and first-year students. Find out more by clicking here. Theatre majors can established careers as directors, costume designers, technical directors, tour managers, lighting designers, actors, drama teachers (college, community, and high school), musical directors, artistic directors, and stage managers. You could also work in fashion design, event coordinating, arts administration, civic leadership, graphic design, or managerial positions.Our program also prepares you to enter graduate programs. Daniel Sheridan '05 is the Performing Arts Supervisor for Davenport Parks and Recreation and the Artistic Director of Davenport Junior Theatre. He was a founding member of the QC Theatre Workshop. Aaron Randolph III '02, '10 is a strong presence in the Quad Cities theatre scene. He is founder of the Quad City Theatre Workshop and was the 2016 recipient of the Quad City Arts Lloyd Schoeneman Community Impact Award for Outstanding Artist in performing arts. Eric Behnke '04 tours the country as an Automation Carpenter for the North American tour of "Dreamgirls." This is the suggested plan of study to graduate in four years with a Bachelor of Arts degree in Theatre. This plan assumes the student has not taken three years of foreign language in high school. *Theatre Practicum may be taken for 0-1 credit. Majors must take theatre practicum at least 3 times to graduate. No more than 3 credits of Theatre Practicum can be applied to the 120 credits required for graduation. 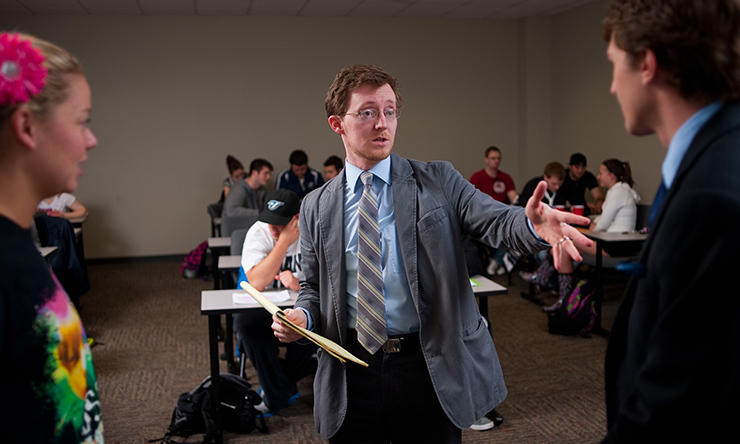 For education courses required for a teaching major see Education Department section.